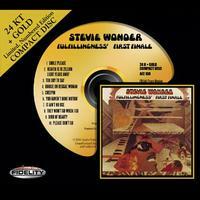 Fulfillingness' First Finale is the album released between Innervisions and Songs In The Key Of Life during Stevie Wonder's highly acclaimed 1971-76 multi-platinum, multi-Grammy "classic period." His most gorgeous work is poignant, scathing and soulful, personal and political, buoyant with gospel overtones, filled with Motown horns and funky organ, tragic with mature discontent. The mood and tone of his songs are perfectly represented in the vocals. Wonder can go from the smoothest, silkiest vocals to straight out rock. Fulfillingness of Pleasure Principle - A Most Worthy Upgrade! I first heard this album, intently and in its entirety, when back in the 90's I borrowed the standard issue CD from a good friend of mine - on his highest recommendation no less. Even though the sound quality was nothing spectacular, the songs served as a hallmark of testimony to the incredible talent of Stevie Wonder. Happily, and, suffice to say, this Audio Fidelity HDCD is a definite sonic improvement! As well, the packaging of this limited edition, numbered CD is a very nice touch.